I like to think I am a very open minded person. I try to support the interests of my children. I let them choose their clothes, etc. I don’t even fuss when they proclaim to be a KU fan and a K State fan. My daughter pledges no allegiance. She’s a smart cookie. I was even pretty cool last night when my Cyclones couldn’t grab a win in the octagon of doom. Octagon of doom?? 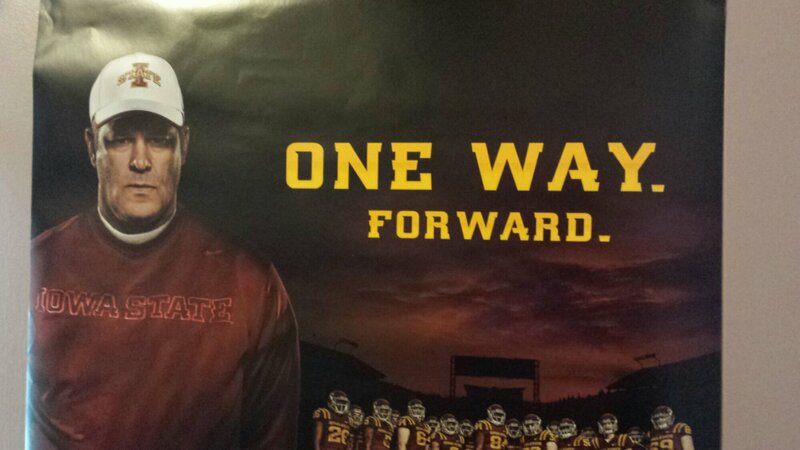 I much prefer the way Hilton magic rolls off the tongue, don’t you? When I told him who one after he inquired from the other room, he was really quite ecstatic. Ok. This morning, I thought nothing of it when he came over for a big morning hug. He is my baby boy and probably a mama’s boy and one of the best snugglers in the history of ever. He even whispers nice things sometimes too…which is what I was expecting when he leaned close to my ear. After a pause, he whispers, “who won the game Mom?” Ohhhh! The grin burst out from ear to ear and he was sick with giggles as I chased him off my lap and across the room. He was pretty proud of himself. Funny how opportunities present themselves to you, isn’t it? I found a gift for him while he was up the hill at his friend’s house. I’m pretty sure he’s gonna love it! This entry was posted in Family, Random, sports and tagged Cyclones. KState. family shenanigans. Bookmark the permalink.